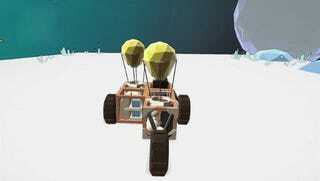 Autocraft is a physics based puzzle game about building a variety of vehicles to accomplish objectives. I've already written about it previously. It's now available on Steam via Early Access. It's currently only $8.49 USD with a 15% launch discount. I'm not going to drone on about it too much but it's quite the fun little puzzler. I took another look at it in this new video where I was intending to show off lots of levels, but the game had other ideas. I fail over and over to find the right combination of form and function with my little balloon car. PSA: some profanity in this video. In my "Let's Lookit" vids I don't censor myself.